We highly recommend you visit Isabella Boutique for an expert fitting with one of our Certified Fitting Specialists. Every woman is different — so is every bra, mastectomy bra and breast prosthesis. An expert fitter will ensure that you are fitted with a bra that works best for your size, frame and build. Also it is important to understand that appropriate bra and breast prosthesis fitting is not merely for cosmetic reasons. When a breast is removed, the body is no longer in balance and will compensate with slight curving of the spine and “shoulder drop.” Both conditions can lead to chronic lower back pain. Also, wearing an incorrectly sized bra that does not fit properly or forces the breast form into a different shape can cause the form to crease or to be distorted. When your bra fits properly, you instantly look better in all your clothes. Also, a good fitting bra can make you look slimmer. Your bra band should fit snugly while on the center hooks. You should not have more than a two-finger space behind the band. The band should be parallel to the ground and sit low on the back. The weight of your breasts should be supported through the back of the bra; shoulder straps should be adjusted accordingly and should be snug on your shoulders. The center piece of the bra that is between the cups is called the gore. It should lie flat on your chest. Breasts should be well contained within the cup. Bulging above the bra or underarm edges means the cup is too small. 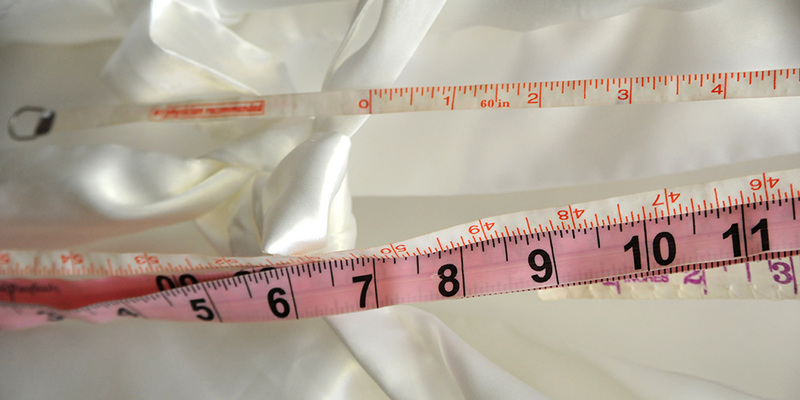 Keep the measuring tape parallel to the ground and measure around your bra directly under the breast. Pull the tape snug and round up to the nearest even whole number in inches. Stand straight with your arms at your sides and measure at the fullest part of your bust while wearing a non-padded bra. Make sure the measuring tape is parallel with the floor and not binding. Round all fractional measurements to the nearest whole number. Calculate your cup size by subtracting your band measurement from your cup measurement. The difference between the two numbers determines your cup size. Remember that all bras are different. An adjustment in band or cup may be needed depending on the manufacturer. We provide expert, free bra fittings every day at Isabella Boutique. Our Certified Fitting Specialists ensure a warm and compassionate experience to every customer who visits our store. They can assist you with any kind of bra you are shopping for, and can ensure you find the perfect fit. If you have any questions, our Certified Fitting Specialists are only a phone call away. Our fitters are certified through the American Board in Certification in Orthotics, Prosthetics and Pedorthotics, Inc. (ABCOPP) requires a high school diploma, GED or college degree and completion of a National Commission on Orthotic and Prosthetic Education (NCOPE) approved mastectomy fitter pre-certification education course; Completion of 500 hours of mastectomy fitting patient care experience obtained either before or after completion of your education course; The three-hour, multiple-choice exam consists of 150 items designed to measure your knowledge of mastectomy fitting. Knowledge assessed on the exam includes patient assessment, formulation and implementation of a treatment plan, follow-up care, practice management, ethics and professionalism.